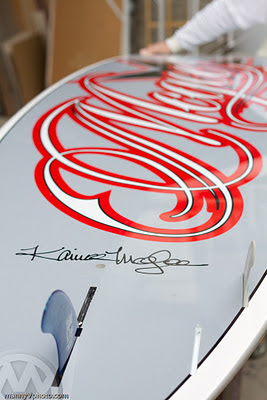 Stand Up Paddle Surfing: New Boards/New Ideas: Kainoa McGee Stand Up Boards and Plus One... a new Racer? New Boards/New Ideas: Kainoa McGee Stand Up Boards and Plus One... a new Racer? Just got these shots from my friend Manny Vargas (check out his awesome surf water photography at mannyvphoto.com). Some really cool stuff happening here in Southern San Diego. 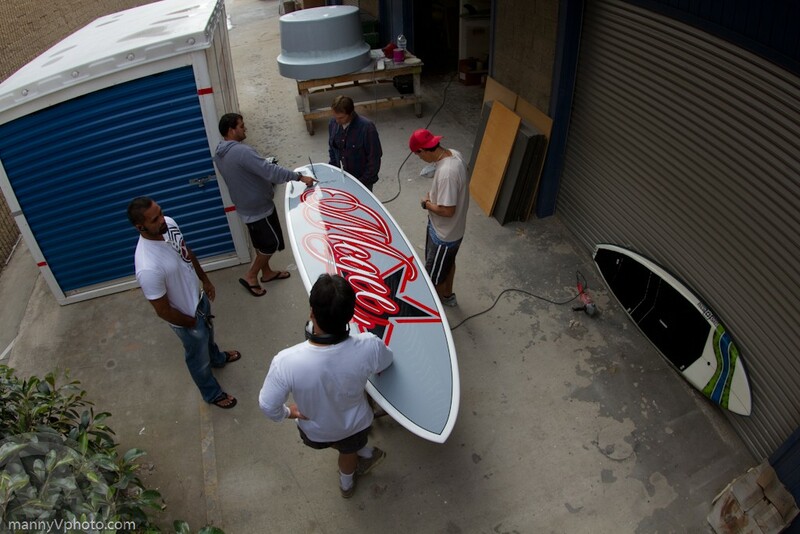 First of all Mike Pilgrim of SurfCraft International (click here to see more of what Mike's got going on) is teaming up with Hawaiian hellman and pipeline charger Kainoa McGee to get Kainoa's new stand ups out here in So. Cal. - from the buzz around town the boards are sweet and there's five or six local guys waiting in line to get there chance on the demo boards Mikey's got stashed somewhere (pics below). Also, it turns out that the mad scientists at Plus-One are putting together race boards and jumping into the game with stock class boards as well as fourteen footers. All of this dutifully recorded by Manny V., check out his shots below. Here's a peek at one of Kainoa's boards- love the diamond tail. I'll hop on one and give you a rundown of how it goes as soon my colon decides to stop hating me. That's Mikey in the foreground, gray sweater with big Kainoa in the background (short sleeve teeshirt, right side). 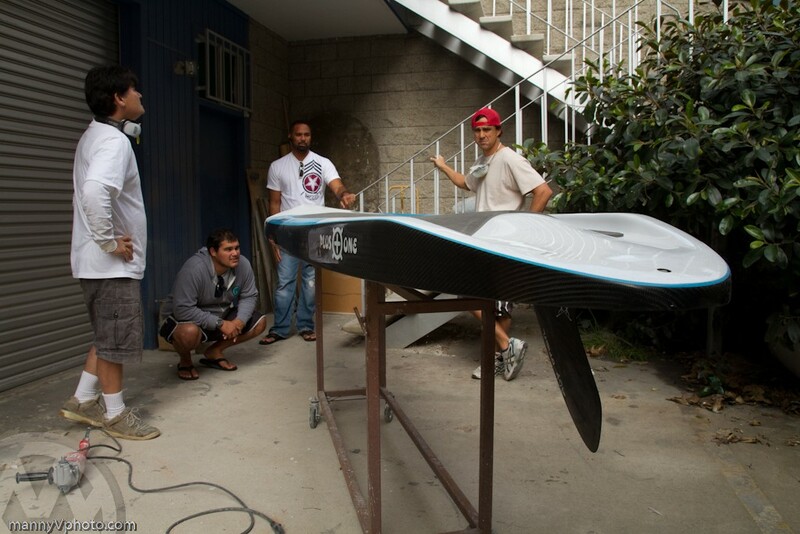 Various Plus-One board wizards checking rails and fin placements. Wide angle/high angle: love the perspective Manny V.! Top-side Kainoa board... like how foiled the tail is... low volume. Okay, on to the new Plus-One raceboard: Stock class, rounded tail. As you know I'm a big fan of the high volume wide-assed race board (but what do I really know- I'm a middle of the pack racer, remember?). I just get the feeling that for most of the conditions we're in here in California a really pulled pintail isn't the way to go- the tail sinks with each power stroke and you can here the gurgle of vortex turbulence off the back. I like what the boys have gone with here- I'd like it better if I got a chance to actually paddle the beast. If anything, from what I know about Plus-One, the fit and finish (read glass job with tricky carbon fiber) is probably A+ on this thing. And, if my little spy resources are correct, the glass job is probably some exotic, multi-material layup that's ultra-light and damn strong. Check those boxy rails... hmmmm.